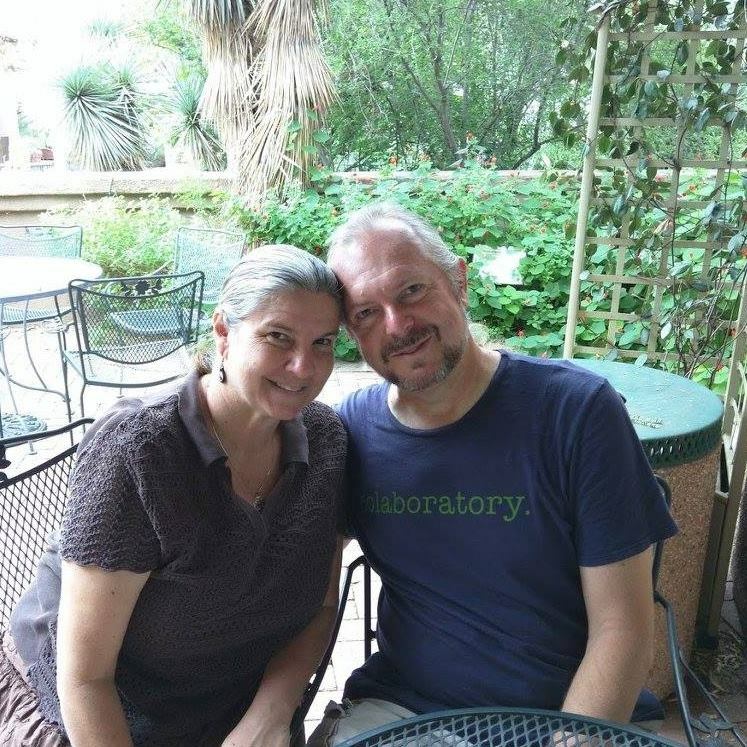 We are blessed here in Southern Arizona to have reliable, clean water sources at a very low cost. Less than two cents per gallon...even if you are using water at the highest residential use rate. 1/10 of a cent per gallon at the lowest rate. Try buying a bottle of water at the store for two cents! But this water comes at a cost very few of us are aware of. 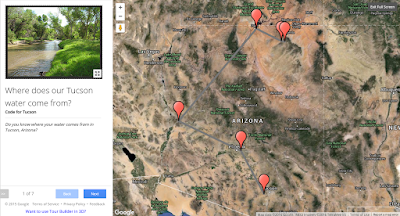 I didn't realize just how energy-intensive, polluting, and wasteful our cheap water was until I mapped the process of getting water to Tucson at the recent Hack for Change Tucson event. As an engineer, I can appreciate the tremendous marvel of technology the Central Arizona Project is. It pumps more than 456 billion gallons of Colorado River water to agricultural and residential users in Phoenix and Tucson - a distance of 362 miles and more than half a mile uphill. The pumps that move that water are powered by the enormous Navajo Generating Station - one of the largest emitters of carbon dioxide (a primary greenhouse gas) in the United States. All of Tucson's water coming from the Central Arizona Project and 10% of Tucson's electricity is powered by the NGS. But there isn't just one coal-fired plant we rely on. Have a good look at this image. (This is a figure from Chapter 5 of the Tucson Electric Power 2016 Preliminary Integrated Resource Plan. I would highly recommend getting familiar with this document. 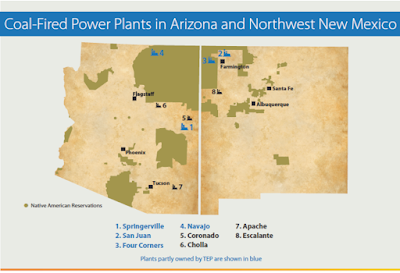 The final version scheduled for release in 2017 describes how TEP plans to meet its share of the EPA Clean Power Plan requirements for Arizona.) But the thing I find most disturbing about this map is the location of the power plants in relation to the Indigenous Nations. The green areas on the map are the boundaries of these nations. Notice how close the eight power plants in the map are. In some cases, they are inside the borders. 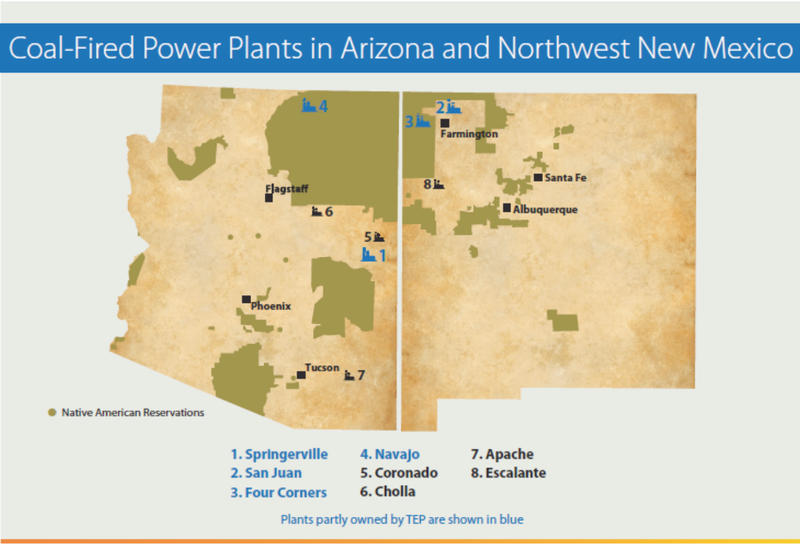 However, NONE of these power plants are owned by the people they are located next to. They are all owned by private operators and consortiums of utility companies. The usual agreement, as was the case with the Navajo Generating Station, is for a government entity to lease the land from the tribes and then to turn the construction and operation of the plants and supporting coal operations over to private energy companies. The tribes get jobs, annual lease payments, and low market rate payment for the water used from their aquifer. Is that a fair price for what they are losing? What happens when the generating stations are eventually closed down? The jobs will go away, the lease payments will go away, but the generational health effects and environmental degradation will remain. We've outsourced our pollution to the poor...again! This image? 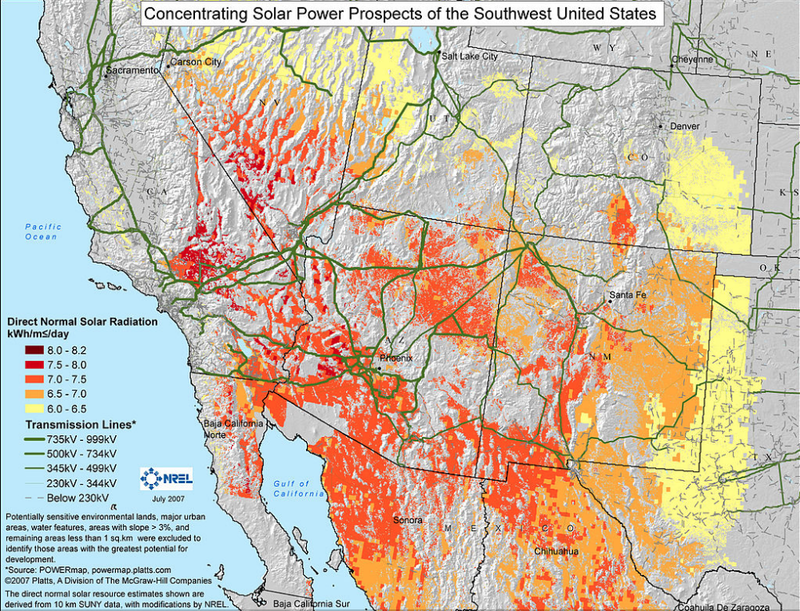 That's the National Renewable Energy Laboratory estimate of the solar power generation capacity in the Southwest. All that orange and red? Those are areas that receive enough sunlight to average between 6.5 and 8 kiloWatt-hours per meter of surface per day. This means that many of us who are fortunate enough to live in the Southwest could power our homes most of the year using solar panels on our roofs. Why are we relying on burning all this coal in a part of the country that has such abundant free energy? At this point, you're probably saying: This is all well and good, but what can I do? I have no power! Well, you can choose to read the news releases after the decisions are made and gripe on Facebook about how they've done it again - or you can make your voice heard. TEP's Final Integrated Resource Plan isn't due until next year. Read the Preliminary IRP and let them know what you think! On a statewide level, the Arizona Department of Environmental Quality will be working on Phase III of the Arizona Clean Power Plan until September. ADEQ holds public stakeholder meetings to provide feedback on the plan. You can attend in person, or you can call in to listen to the meeting and submit your questions and comments via text. UPDATE: Navajo Generating Station is closing. Tribal leaders, utilities, the federal government and energy companies must address injustices of the past to pave the way to a clean energy future for the Navajo. Find out how here! It's a long road to sustainability, but I believe we can - and must - get there!